Posted July 31, 2018 & filed under VOLCANO DREAMS. Last week I described the Yellowstone volcano. The magma that fuels the volcano also fuels the thermal features that you’ll see in the Park: geysers, hot springs, mud pots, and steam vents. 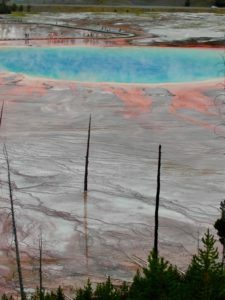 Heat flow deep inside the earth beneath Yellowstone is the driving force behind – or more accurately, beneath – all of these features. constricted, like the difference between blowing the same amount of water through a hose or through a straw. Steam without much water forms a steam vent, or fumarole. Hot springs and mud pots form when the water rises without becoming highly pressurized. The mud pots are fo und in places where the hot water bubbles up through clay soils, and these can form brightly colored “paint pots”. 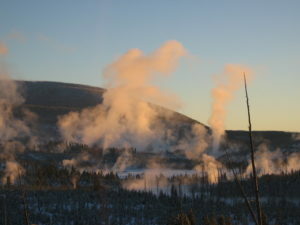 Some geysers erupt continuously. And some erupt at random intervals. Steamboat Geyser in Norris Basin is currently the world’s largest active geyser, and its eruptions can reach almost 400 feet high. Steamboat’s eruptions cannot be predicted and it has been quiet for as many as 50 years, but lately it’s been erupting quite often – 8 times since April of this year (2018). Why? It’s not clear. Perhaps the earth has shifted a tiny bit (which happens all the time), allowing more water down and then back up again. 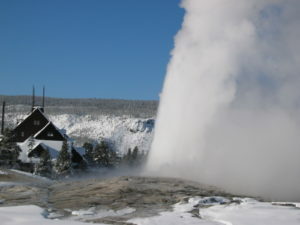 The most we ll-known regular geyser is Old Faithful, which erupts on average every 90 minutes, and can reach heights up to 200 feet. Because it’s so regular, it’s easy to plan to see it when you visit. The thermal features in Yellowstone are truly beautiful, but they are deadly hot. A white crust surrounds many features, and it is highly unsafe to walk on. If you go to Yellowstone please, for your own safety and to preserve these fragile features, obey all signs and stay on walkways. « What? We’re Inside A Volcano? !